Do you want to check JSC Result 2018 by sms? So don’t worry here is workable process to check JSC Result by SMS. You can easily able to check your result using mobile sms. How To Get JSC Result 2018 By SMS. Are you looking for JSC Result 2018 SMS Method? Don’t worry! Here you can get the easy way to check JSC Result by sms. We have described here full details for JSC Result 2018 by sms getting system part by part for All Education Board JSC Result 2018 Of Bangladesh Education Board. 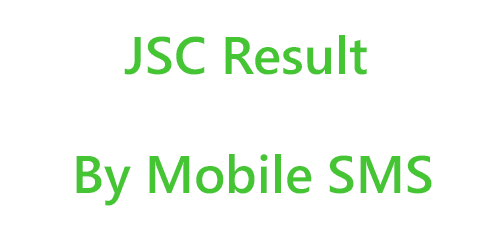 You can learn here to get JSC Result 2018 Using Mobile SMS. You can easily able to Get JSC Result 2018 Using Mobile SMS.Bangladesh Education Board has total nine boards for Secondary School Certificate (SSC) examination. And total 10 education boards for Higher School Certificate (JSC). So here we have discussed total ten education boards JSC Result 2018 getting system using mobile. Get JSC Result 2018 from mobile phone, it is very easily and cheaply system to get result instantly. Because nowadays mobile phone usable for every people of Bangladesh. I think 99% people use the mobile phone of Bangladesh. So every Guardian or JSC examine can get their JSC result using mobile sms after 02.00pm. Every people or students use mobile phone for many reasons, we have already tolled that. But maximum students do not know how to get JSC Result 2018 Using Mobile SMS System. So if you do not know about this, so follow the easy step below ↓ for getting JSC Result 2018 From Mobile SMS. At first “Flaxiload” your mobile sim card. If you already have enough account balance, so no need to “Flaxiload” again. Because only need 2.50 Taka to get JSC Exam Result 2018 from mobile phone. So now, Go to your messaging option from your mobile. Then Select “Write Message”. Now firstly write here JSC and give a space. Then type first three letters of education board. Example, if you are candidates of Dinajpur Education board, so you have to write here DIN. Then give a space to pressing “0” button from your keypad mobile phone. Now type here your JSC Exam Roll Number. Then leave a space again, now write here JSC Exam Year. This is 2018. Now your sms is “Complete” to send to Official education board’s service provider’s number. So now send your message to “16222” on this contact number. After some time later you can get a reply sms from this number. It is your most wanted JSC Result By SMS. After some time later you can get your JSC result. After some time later you can get your JSC result of Dhaka Board. Some time later you can get reply sms from 16222, this is your result. To get JSC Result 2018 Barisal board by sms, so see below to how can you do this. If you use Teletak number so you can get your result instantly. Some second later you can get your result on your mobile. Hai, are you JSC examine of Dinajpur board?So you can also able to get JSC Result 2018 from mobile sms using your mobile phone. How can you do that, see details below. You can get your Dinajpur board JSC Result 2018 shortly by sms from you’re your mobile. Comilla education board is a very good education board of Bangladesh of educational qualification. If you student of this board so you easily able to get your result from your simple mobile phone. So follow the steps to get Comilla Board JSC Result 2018 by sms . After some time later you will get your result from sms. Do you want to get Jessore board JSC Result 2018? And from mobile, so see it below. After sending the message you can get a reply sms shortly. Thanks to visiting our site to get JSC Result 2018 By SMS.I hope you are success to get your JSC Result 2018 of your own education board.If you face any problem to get your result by sms or online, so feel free to contact us. Just comment your JSC Board name, Roll and Registration number.We will reply your result as soon as possible.